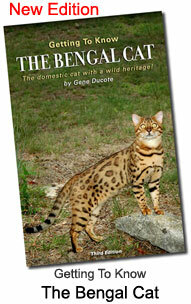 When Gene Ducote, Bengal lover and breeder, realized there where no real valuable sources of information to guide Bengal owners, she wrote "Getting To Know The Bengal Cat". 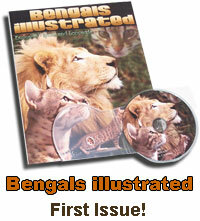 There is also loads of new information, including the new accepted colors, and special chapters of some of the most common problems breeders and pet owners are faced with.Â This soft cover book isÂ designed for Bengal owners, but much of the health and care info is valuableÂ relating toÂ other breeds as well.Â . 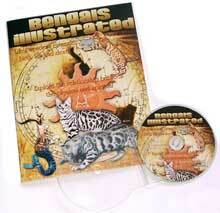 Selection & evaluation of your new Bengal | kitten or cat? male or female? Health | Immunizations to various diseases to avoid! 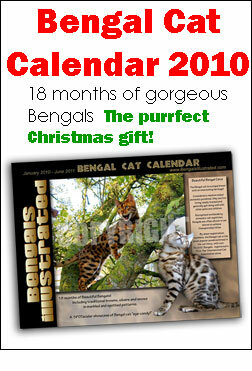 A FULL year and a half, from January 2010 through June 2011, FORTY FULL COLOR, over-sized pages at 9" x 12" this calendar features the exquisite beauty, playful nature and stunning magnificence of the Bengal from kittens to cats! 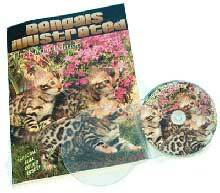 Featuring Bengals from around the world and includes some of the top Bengal breeders worldwide, too!Full Color, 9" x 12" Bengal cat calendar- FORTY pages. Packed full of photographs and more! ....and many more fantastic articles in this spectacular issue! ...and there these are only a few of the article highlights in this spectacular issue! An Interview with breed originator, Jean Mill, Read it here first! ...these are only a few of the article highlights in this spectacular issue! For ALL breeds of cats. This very complete 158 page handbook covers everything from selecting your breeding cats, costs involved in breeding, keeping a stud cat, prepartum, pregnancy, postpartum, feeding, raising and placing kittens, commonly prescribed medications, vaccinations, herbs for cats, advertising and so much more! 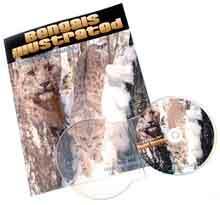 A vendor listing of where to purchase products; where to get product catalogs, vendor websites and contact information! 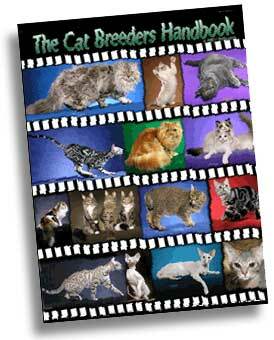 The Cat Breeders Handbook is sure to be one of your best guides! For new breeders and seasoned breeders looking for a valuable source of information all in one place! There are numerous Illustrations with OVER 100 photographs including many from world renowned photographer Helmi Flick and many others.